January 12 is the birthday of the titan of TV dinners—Dr. 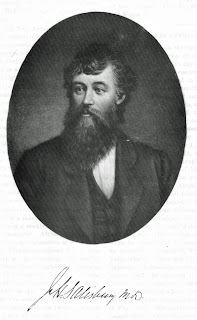 James Salisbury. Bon appétit. Is it more regrettable that Dr. Salisbury’s medical legacy is his chopped beefsteak namesake or that his professional recommendation was to eat it three times a day? James Henry Salisbury was born in New York state in 1823 and worked as a chemist before becoming a physician in 1850. Like Sylvester Graham before him (see graham cracker), Salisbury was convinced that personal diet was the cornerstone of good health, though their theories could not have been more different. 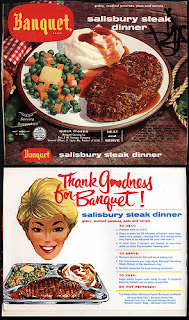 Graham was a staunch vegetarian who believed that a carnivorous diet led to lustful urges, while Salisbury was convinced that a daily beef tripleheader could thwart pulmonary tuberculosis, asthma, anemia, and gout. In addition to other battlefield horrors, Salisbury witnessed widespread diarrhea during his stint as a field doctor in the American Civil War. He eventually posited that a steady flow of coffee and ground beef was the best treatment. By 1888, he was the proponent of a full-fledged fad that called for two-thirds of one’s diet to be filled with meat and claimed that too many vegetables and starch produced poisons in the digestive system that led to heart disease and even mental illness. Salisbury further advised that the beef be well-done and accompanied by hot water before and after meals. By the time of his death in 1905, the ground-beef patty Dr. Salisbury was prescribing was referred to in many parts as Hamburg steak, though historians (and business owners) often argue whether this refers to Hamburg, Germany, or Hamburg, New York. Regardless, the association with Germany was somewhat inescapable, and the advent of World War I and then World War II prompted some unusual patriotic revisionism. At the same time that sauerkraut became “liberty cabbage” and the German measles became “liberty measles,” the Hamburg steak officially became the Salisbury steak. This was by no means the last time such nationalistic menu-tweaking took place. Following the Turkish invasion of Cyprus in 1974, restaurants in Greece began serving “Ellinikos kafes” (Greek coffee) instead of “Turkikos kafes” (Turkish coffee). In 2003, following French opposition to the United States invasion of Iraq, the U.S. House of Representatives changed the menus in its cafeterias to serve “freedom fries” and “freedom toast” instead of their French counterparts. Meanwhile, the producers of French’s mustard issued a press release assuring a worried public that its family name should imply no lack of patriotism. 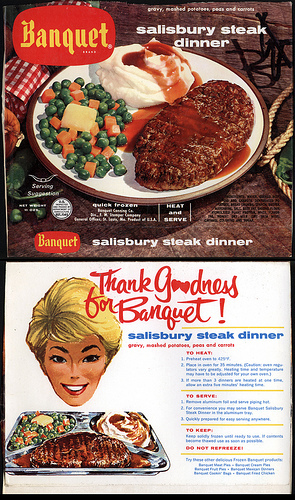 While the original names for hamburgers and sauerkraut have since largely returned to general usage, the Salisbury steak remains a jingoistic holdout. Today, Dr. Salisbury’s prescription—a minced beef patty, shaped like a steak, and typically served with thick gravy—is an all-American icon.